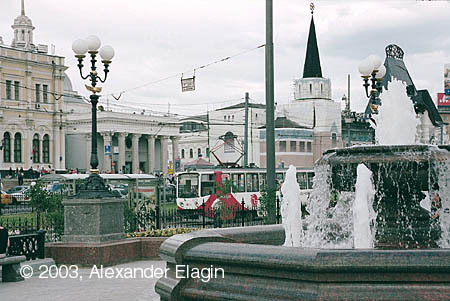 Komsomolskaya Square is one of the greatest transport sites of Moscow. There are three commuter rail terminals, one more railway station and two Metro stations in this square. Surely, the transportation of people from the railway to the city centre and back was necessary from the construction of these terminals, so the first line of a horse-drawn tram came here as long ago as in 1875. This line was converted to the electric operation in 1905, and specially for this line a new electric substation was constructed in Krasnoprudnaya Street. Years went by, and the square was changing, too. 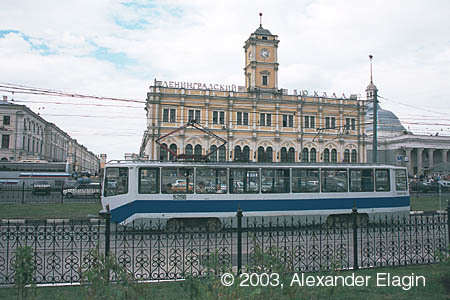 The tram terminus was moved from the square to an adjacent Kalanchevskaya Street, a line towards the city centre disappeared in 1935 after the first Metro line construction had been over. 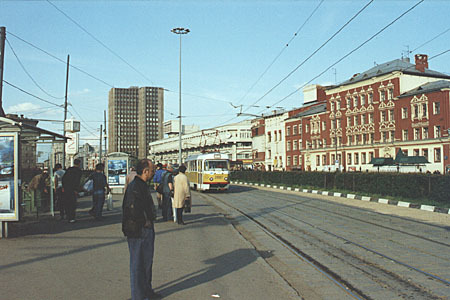 Yet the line from Komsomolskaya square to Sokolniki along Krasnoprudnaya and Rusakovskaya Streets is still in service, and is perhaps the oldest survived tram line of Moscow. Komsomolskaya Square. You can see the Kazanskiy Vokzal (Kazan terminal) being reconstructed in the distance. The tram stop is in the centre of this square, with pedestrian tunnel connecting it with four railway stations and subway. And this is a view of tram tracks in the centre of the square. 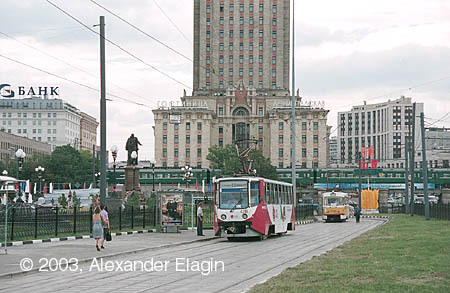 The dark-red building to the right is a railway workers' culture club constructed in late 1920's, and the next one (of grey concrete) is one of the largest department stores of Moscow. Finally, the high tower was constructed for the computer centre of the Soviet (now Russian) Railways. Leningradskiy Vokzal (Leningrad terminal) is the oldest railway terminal in Moscow and one of the oldest in Russia. First main-line railway in Russia - from St. Petersburg to Moscow - terminates here; regular service on that line was begun as long ago as on 1st November 1851. I must note that only the face of the building was preserved after the renovation that took place in 1970s, the other parts of the terminal are fully modern. 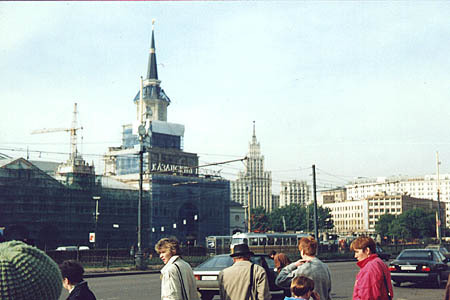 A surface pavilion of Komsomolskaya metro station is positioned between Leningradskiy Vokzal and Yaroslavskiy Vokzal. The latter is the starting point of the world's longest railway line, the Trans-Siberian railway that connects Moscow with Vladivostok on the Pacific Ocean. Komsomolskaya Square is enclosed from the south-west by a tall building of Leningradskaya Hotel, one of the seven Stalinist skyscrapers built in Moscow in early 1950s. However, the building is separated from the square itself by a railway overpass. There have been multiple projects to get rid of this overpass and put the railway in a tunnel, but none of such projects since 1930s have been ever implemented. 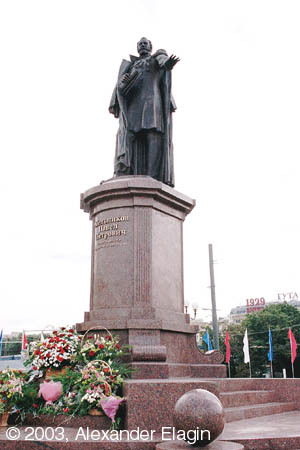 A monument to Pavel Melnikov in Komsomolskaya Square was unveiled in August 2003. Pavel Melnikov developed the project of the St. Petersburg - Moscow railway line and headed the construction. He was one of the most educated people of those years, and shared his knowledge with many others; we regard him as the first professional railway constructor in Russia.